Local residents of Louisville, Kentucky responded in droves to a Craigslist ad asking for their treasured trash for an art installation at the Land of Tommorow. SuttonBeresCuller, a trio of artists from Seattle, then took these donated household objects and worked them into a large installation called Small Moons. Geodesic dome armatures serve as the base while the treasures were wired onto the structure to create a mass of trinkets, kitsch, knick knacks and memories. 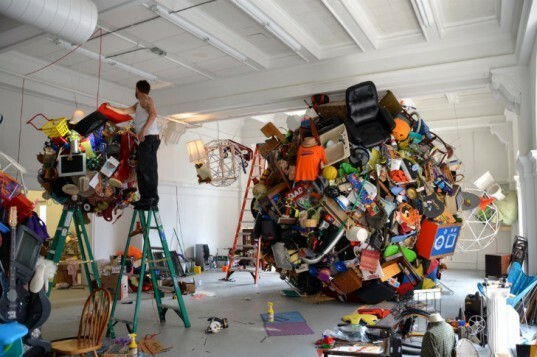 Small Moons is a large-scale art installation by Seattle trio SuttonBeresCuller, made from collected and unwanted objects. Sponsored by artwithoutwalls, John Sutton, Ben Beres and Zac Culler, asked local Louisville residents via a Craigslist ad to donate their trashed treasures or treasured trash to be part of an art installation. For the month of September, the trio built four geodesic domes from PVC pipe and then wired the donated materials onto the domes. “We sent out requests for people to bring in their trashed treasures or treasured trash, things they no longer wanted that they might otherwise give away or throw away,” says artwithoutwalls director and 21C chief curator Alice Gray Stites. “These sculptures are portraits of the community, a collective vision of Louisville.” Everything from dolls, stuffed animals, statues, lamps, clocks chairs, bikes, toys, tvs, fans and much more are part of the installation. Things that use power were even wired in and operated for the exhibition, so clocks blinked, fans whirred and lamps glowed. Small Moons was on view at the Land of Tomorrow gallery from the end of September through the beginning of November in 2012. 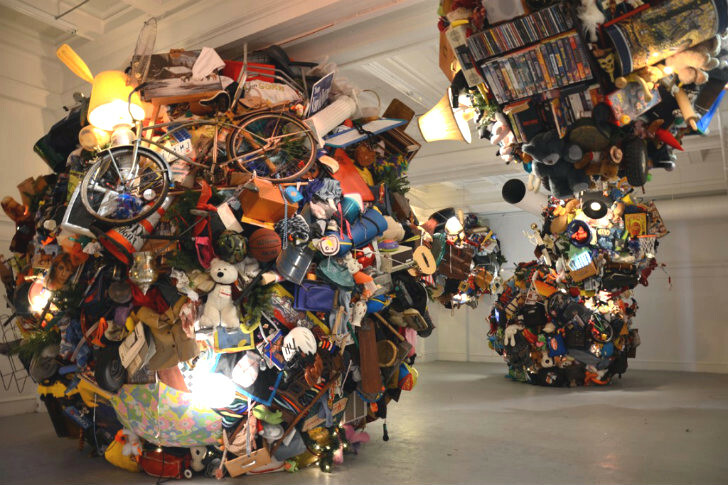 Small Moons is a large-scale art installation by Seattle trio SuttonBeresCuller, made from collected and unwanted objects. Panoramic view of Small Moons. Sponsored by artwithoutwalls, John Sutton, Ben Beres and Zac Culler, asked local Louisville residents via a Craigslist ad to donate their trashed treasures or treasured trash to be part of an art installation. For the month of September, the trio built four geodesic domes from PVC pipe and then wired the donated materials onto the domes. "We sent out requests for people to bring in their trashed treasures or treasured trash, things they no longer wanted that they might otherwise give away or throw away," says artwithoutwalls director and 21C chief curator Alice Gray Stites. “These sculptures are portraits of the community, a collective vision of Louisville." Everything from dolls, stuffed animals, statues, lamps, clocks chairs, bikes, toys, tvs, fans and much more are part of the installation. Things that use power were even wired in and operated for the exhibition, so clocks blinked, fans whirred and lamps glowed. Small Moons was on view at the Land of Tomorrow gallery from the end of September through the beginning of November in 2012. After the exhibit ended, individual items were returned or donated, while the domes donated to 21C’s collection, where they will help create similar exhibits in other cities. Small Moons is a collection of memories and treasures. A child looks in wonder at one of the spheres above.